Uniquely designed by a team of Australian industry experts, Esatto products are crafted around the specific demands of Australian homes. Practical in design and function, this Esatto dishwasher has a 14 place setting capacity, stainless steel finish and collapsible plate racks for your convenience. Whether you wash everything in one go or prefer to do half loads, this Esatto dishwasher gives you the flexibility to choose. 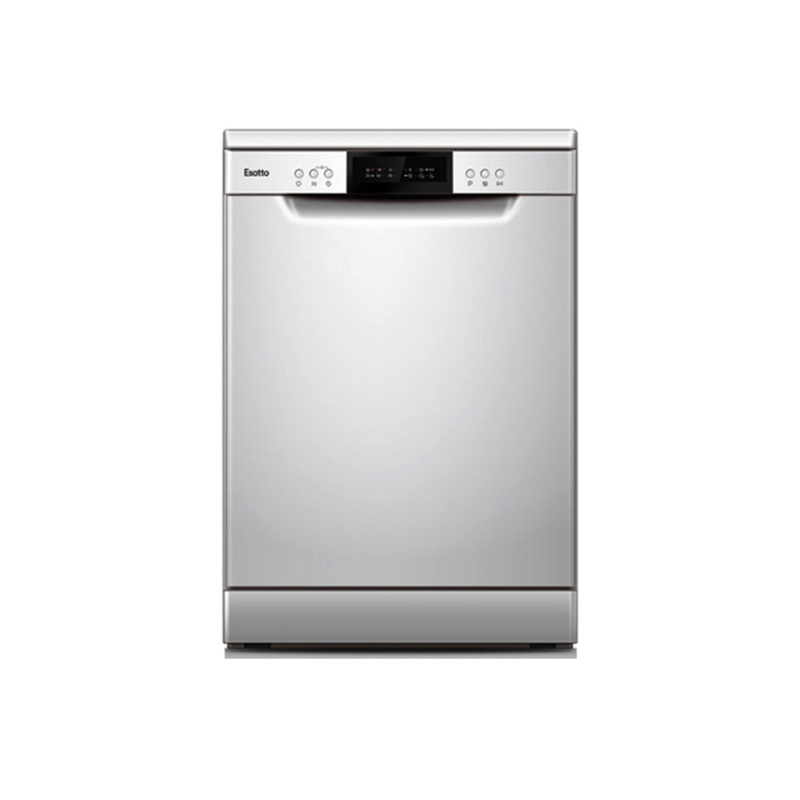 The half-load function and height adjustable upper basket, make this dishwasher practical for varied washing. And if you prefer to wash in the middle of the night, this dishwasher allows for simple delayed timer programming. Backed by Esatto’s two years warranty, you’ll wash with peace of mind thanks to Esatto. Whether you’re taking advantage of off-peak water or energy rates or if you simply prefer to come home to clean dishes, the 3, 6, and 9 hour delay timer in this dishwasher allows you to program a wash when it suits you best. If you’ve only got a half load to clean, there’s not much sense in running a full wash. Thanks to the half load wash program in this dishwasher, you can wash half a load guilt-free. The generous 14 place setting capacity in this dishwasher allows you to wash all the dishware of a 14 person, three-course dinner, which means you’ll easily clean up after a big cook. Only had a couple of months so far so good.Dishes come out sqeaky clean.Had to get used to the stacking arrangement seems a bit odd compared to my Westinghouse which died after 5 years.Overall great machine. I purchased this just over a month ago and itâ€™s such a great dishwasher. Itâ€™s large and well built. Works really well and is very quiet. Love it! Great price, free delivery the next day. I was very happy with my new dishwasher. I got a great price and delivered free the next day. Thank You. I bought the dishwasher a month ago. After 2 weeks the door latch broke. Cant use the machine because its leaking. Still waiting for a technician to contact me and it was suppise to take 24h. Very functional and easy to use Dishwasher. It looks good and is much quite then the previous one we had. My Asko dishwasher was going to cost more to repair than the cost of the Essatoto buy. Great service from Appliances online. The Essato is amazing, cleans better than my Asko, is quieter , bigger inside and cleans better. Highly recommend. Quick delivery, and free. Excellent value for the money, good looking machine plenty of functions, and very quiet. Washes the plates and glasses really well. Wish i never purchased it! This dishwasher is terrible! Didn't work properly from day 1, water leaked from underneath it, damaging my timber floors. Warranty is ridiculous. Came out after a week, got it going and now the water doesn't even drain, jut sits in the bottom. So im not using it. Now got to call warranty again as I cant use it its useless! Don't buy this machine beware. I bought this item a few weeks ago and find it easy to use. The price is very affordable and the wash is fine. The real review should come in a few years. At the moment the dishwasher works well. The machine seems to be good value for money. Ideal if you are not wanting or expecting 10-years of trouble-free service. Just the kind of dishwasher for a rental property where it may be subject to some rough treatment. Does the job and doesn't cost a fortune. Bought it nearly two months ago. The intensive feature does an excellent job everytime. The Eco mode does miss a few spots. Generally a good washer. Haven't had issues so far and is easy to use once you know what each mode does. Really good so far, very spacious bottom for the bigger plates. I wish the rack spikes as the top were a bit longer as it limits what and how we place things there. No other complaints, very good for the price. Bought easy, delivered promptly but unfortunately was damaged. No probs with Customer Service when contacted and a replacement was quickly despatched. Unfortunately this replacement was damaged also. Looks like too much weight was placed on top of these units which caused crushing of the units. In the end we opted for our money back. Customer Service was easy and prompt in dealing with these issues. Hopefully we may buy something in the future. Delivery guys were really great and dishwasher was delivered in under 24 hours. We've had this dishwasher for about a month. Does an excellent job of washing and drying the dishes. Don't really like the set up of the top rack and both racks can be a bit temperamental to push back into the dishwasher - they need to be pushed exactly straight or they get caught. But overall would recommend and happily purchase again. We bought this a few weeks ago to replace the 41/2 year old omega that just did not power on. Tenant says he can't fault it. I purchased the Essato dishwasher a few weeks ago and noticed it leaves the dishes clean but wet (on eco cycle) otherwise no problems so far. Don't bother with this if you want your dishes to come out dry! Its terrible on all settings. It has an additional 'drying' function, which does nothing. Every setting the dishes come out soaking wet. I'll be asking Appliances Online for an exchange to one that actually works. Have used it for a month. Has all the features needed and cleans dishes wonderfully. We bought the dishwasher recently and we are very happy with it. Cleans perfectly and it is super quiet which was one of the main thing for us. The dishwasher is very good performance and looks wise. It gets only 3 stars as we really miss the quick wash facility (less than 30 minutes which also dried the dishes) and there is slightly less room inside than we imagined so we have to have the top shelf up higher to accomodate the plates at the bottom which means we can not fit any wine glasses or drink bottles which we would normally usually use the top rack for. Overall we are very happy with the purchase and can live with the slight downside to our previous much more expensive machine. Very happy with my purchase . Previously have bought more expensive dishwashers but the Eastto has all the features and more for a very competitive price . Wouldnâ€™t hesitate to buy other Esatto products in the future . bought it last month, very good value for money. only drawback is short drain hose. I was reluctant to buy for such a cheap price compared to some on the market however how wrong I was. We previously had a Bosch which had to be replaced due to pump problems. The Bosch machine never, I repeat never, cleaned as well as this machine. Great machine which is performing well above expectations. I bought this about a month ago and havent anything bad to say about it. It is quiet and easy to use. It also allows you to lift up the top drawer so you can get larger items in the bottom - I can fit in a full place setting with no bother. Would recommend. This dishwasher looks great and washes well and such a good price. Installation went very smoothly as well. Havent connected it up yet. Still fixing up kitchen. We used to have a Bosch dishwasher. It was less than 5 years old but was horribly unreliable. It had constant errors and we had a number of call-outs. The final straw was when we were quoted almost $400 to replace the heating element (and it would take at least a week to organise. It worked out cheaper to buy the brand new Esatto and turf out the unreliable Bosch. The Esatto was delivered the next day and has been used with 2 full loads a day ever since. It cleans as well the Bosch ever did (when it was working). The only negative is the basket designs are odd, the cutlery basket sits towards the back of the unit and as this is a heavily used part of the machine should be a little more accessible. I love my essatto dishwasher. The dishes come out clean and dry every time. It is quiet and easy to use. Purchased few weeks ago and it has been used almost daily since. Hasn't let me down at all. Cleans better than previous dishwasher which was a more expensive model. We purchased this dishwasher to replace a major brand that failed after three years. This dishwasher not only looks great, but it works really well and I'd say better than our last dishwasher that we paid three times the price for. Quiet, design fits a lot of dishes and cleaning results have been perfect. Great value. I have had this over month now and I am very pleased with the ease of using it and the short wash time if applicable and it is quiet also. I brought this a month ago and makes loud noises and does not dry the dishes st all. Also the dispenser never opens to take the tablet. Love it. Have absolutely no issues with it. Clans well, quiet, easy stacking. Good dishwasher for price paid. Only trouble is Eco mode doesn't clean effectively and the extra drying feature needs to be used every time to stop everything from coming out wet.